If your smile is not becoming to you....then you should be coming to us!!! Would you believe us if we told you that going to the dentist could be a relaxing experience? A visit to Rinehart, Marr & Murdock Dental, PC can be exactly that! Dr. John Rinehart, Dr. Michael Marr and Dr. Matthew Murdock strive to provide state-of-the-art cosmetic and general dentistry. Your smile is our top priority. Our entire dental team is dedicated to providing you with the personalized, gentle care that you deserve. Part of our commitment to serving our patients at our Danville & Lewisburg Family & Cosmetic Dentistry, includes providing information that helps them to make more informed decisions about their oral health needs. This website is a resource we hope you’ll find both useful and interesting. Please browse through our website and be sure to Call Danville 570-275-2684 or Lewisburg 570-523-2624 to schedule an appointment. Danville & Lewisburg, PA dentist, Dr. John D. Rinehart, Dr. Michael Marr and Dr. Matthew Murdock are dental professionals dedicated to excellence in general, restorative & cosmetic dental treatments. Dr. John D. Rinehart, Dr. Michael Marr, Dr. Matthew Murdock your highly trained Danville & Lewisburg, PA dentists, are proud to serve Danville & Lewisburg, PA and surrounding communities with many services including Dental Exams, Cleanings, X-rays, Fluoride, Dental Makeovers, Teeth Whitening, Veneers & Crowns. Please come and visit our Danville & Lewisburg Family & Cosmetic Dentistry, the professional dental office your local Danville & Lewisburg, PA dentist. For the last 10 years I have been a patient at Dr Rinehart's. My teeth were in a degraded state when I first arrived but over the years Dr Rinehart has provided me everything from routine maintenance to porcelain and gold crowns and he has done so with speed, technical quality and caring comfort that leaves other dentists in the dust! Dr Rinehart is a genius of some kind-he restored my smile! Also, I am not an easy patient to have as I abhor dental pain of any kind and my teeth seem to be extremely sensitive to most instruments-I may even be called a "Scared y cat" as I am genuinely nervous even during a cleaning-but the team of good folks in Dr Rinehart's office-Karen, Chris, Julie, Sarah, Mindy to name a few, are truly compassionate and fun people. They function almost as a family and obviously have fun while working hard for their patients-there is love in that office. They are truly gifted care-givers! Specifically, I had a severely cracked tooth that simply shattered below the gum line and I was faced with the choice of a bridge OR an implant. I only know one thing about bridges for tooth repair....people complain endlessly about the accumulation of food. For me the choice was obvious-I had to have an implant! Chewing is terribly important to me as I had lost the sense of smell as a child and the tactile pleasure from chomping down on a good steak or munching on a caramel apple is a BIG DEAL to me-a source of much pleasure!! An implant is a good investment in not just dental health but worry-free eating! Folks, thanks to your efforts and Dr. Rinehart's magical touch - NO SWELLING & NO PAIN... In truth, I was actually scared about this implant as drilling into one's jaw sounds like a 2 week vacation to North Korea! Frankly, I am amazed - - I filled the prescription for the Tylenol and took 2 before bed as a precaution - even though I had no pain... and awoke the next day to nothing unusual. This implant is undetectable. It feels as at home in my mouth as my molars! Dr. Rinehart is a genius - I am in disbelief as to how innocuous and pain free the entire procedure was and the lack of follow-up pain and complications! Please feel free to use this as an implant testimonial for all your other scaredy-cats like me! Did I mention that I am squeamish about all procedures? Dr Rinehart and the angels of mercy that work with him made it unbelievably painless-It was a very simple process that is well planned and reviewed. The outcome is a beautiful tooth that stands up to the normal rigors of dental activity! In closing I heartily recommend dental implants as a viable solution and Dr Rinehart as the care giver par excellence! Again many thanks to his loving and caring staff! Thank you to everyone there. I am very happy that I made the decision to come to your practice. The professional atmosphere and treatment I have been receiving has made the difficult transition to "toothless" more bearable than I thought possible. As my decaying teeth poise themselves to take my life you take them from me. You do this with minimum pain and maximum comfort, beyond anything anyone could wish for. As I sit here 2 days after an extraction of 4, my comfort level is almost restored to its usual state. Thank you again. If I have any regrests they would have to be, I wish I would have come to you sooner. Thank you and God bless every one of you. Till we meet again. May all your smiles be bright! Danville Dentist, Dr. John D. Rinehart is a dental professional dedicated to Family and Cosmetic dentistry such as Exams, Cleanings, Teeth Whitening, Veneers, Makeovers & more. 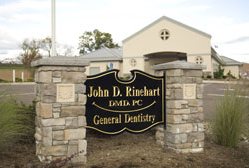 Please come and visit Danville, PA dentist John D. Rinehart DMD.